I've found that you can pretty much never go wrong with barnyard animals at your storytime. I've already posted about cows, but (as anyone in my department could tell you) I prefer a wacky chicken any day of the week. 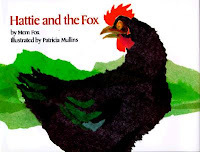 One of my all-time favorite chicken books (and an all-time favorite readaloud, period) is Hattie and the Fox by Mem Fox. Hattie the hen is the only sharp-eyed bird in the barnyard and when she spies a nose in the bushes, she knows it's trouble. Unfortunately her barnyard pals don't seem too concerned. As the fox slowly sneaks out of the bushes, Hattie tries to warn them, but eventually she flies the coop, leaving her friends to deal with the fox in a most surprising manner. You can do different voices for each of the different animals and kids enjoy finding the fox in the bushes (they'll be yelling out "It's a fox!" long before Hattie guesses what it is...). Of course, we can't forget the incomparable Minerva Louise by Janet Morgan Stoeke. This silly chicken is always mistaking objects for something else. She thinks a flower pot might be a nest, she thinks a garden hose might be a scarf. Kids enjoy correcting her and there are quite a few books about her. Minerva Louise goes to school, meets a new baby, hunts for Easter eggs, and much more. 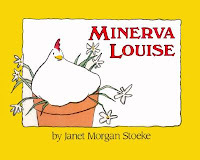 There are also board books about Minerva Louise for our youngest readers. 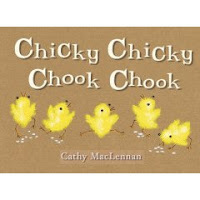 Chicky Chicky Chook Chook by Cathy MacLennan isn't about wacky chickens, per se, but they sure sound wacky. This book is filled to the brim with interesting sounds that help promote phonological awareness. There's a great rhythm to its chanting nonsense phrases as a group of small chickens and other animals play in the sun and are then drenched by a sudden rainstorm. This is a great readaloud for younger preschoolers and be sure and let the parents know that playing around with sounds will help kids hear that words are made up of smaller sounds. 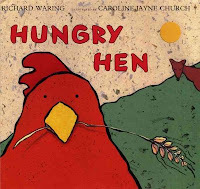 And I have to end with a book I recently discovered through the Kidlitosphere... Hungry Hen by Richard Warring. 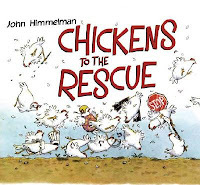 I read about this book in the ALSC Blog (in a post that points out some more excellent chicken and duck books... you should definitely check it out). It finally came in for me at the library and I was instantly in love. It starts with a hen, hungrily eating all the grain in sight. As she keeps eating, she keeps growing fatter and fatter. A fox is watching from a distance, stomach rumbling, but just as he's going to run down the hill and get her, he realizes that if he waits until the next day she'll be even bigger. He waits until he absolutely can't stand it... but just as he's about to - finally! - get his dinner... he's met with quite a surprise ending. Fun and funny and just slightly disturbing (which describes some of the very best picture books, in my opinion...). These are some of my favorite wacky chickens... what are some of yours? I recommend CLUCK O'CLOCK by Kes Gray and Mary McQuillin. Punny, funny, and absolutely worth a look.